In The Color of Law Richard Rothstein lays out the case that segregated patterns of residence in every part of the United States are not the result of impersonal market forces, not just the result of patterns of individual choices among large numbers of people, but are instead the result, often the intended result, of policy and political choices at every level of American governance. The choices were made throughout the post–Civil War history of the United States. Very often these choices were made in opposition to existing law, up to and including defiance of Supreme Court decisions, not least by government institutions themselves. Including lax oversight of predatory lending that targeted African Americans (Rothstein tends to write the term without a hyphen) in the run-up to the Great Recession, these choices continued through 2008. Including choices about zoning, school locations, industrial development and other details of local government, de jure discrimination against African Americans by public bodies very likely continues to the present day. Although the problem of discrimination is by no means relegated to the past, Rothstein draws on the historical record to make his arguments. In a few instances, he supplements that with material from interviews that he has conducted, to add lived experience to the documentary evidence that he is supplying to buttress his contentions. Right away, he demolishes the idea that discrimination is in any way a regional issue, limited to the states of the old Confederacy, or perhaps those plus a few border states. His first chapter is titled, “If San Francisco, then Everywhere?” and his thesis is that if a city that’s regarded as one of America’s most liberal was the scene of official discrimination, then chances were good that it was practiced practically everywhere. I knew from reading Sundown Towns and numerous other books, even riffs on H.P. Lovecraft, that discrimination was everywhere. In subsequent chapters Rothstein shows how public housing, mostly starting with housing for defense workers during World War II was built on discriminatory foundations. A recurring motif of the book is unoccupied units in designated white areas, and overcrowding plus above-market costs in black areas. That happened in publicly built developments and in private developments that had public support through infrastructure and preferential financing. Basically, anywhere that housing was built, African Americans were systematically kept out, steered toward sub-standard locations, packed into smaller areas, only offered rents that could only be covered by increasing the number of people living in a particular dwelling, zoned into areas bordering industrial sites, pushed out of mixed neighborhoods by the targeted construction of parks and highways, and more. The list of lengths to which white people were willing to go to make sure they did not have to live with or near black people is long and appalling. Nor did the white people stop short of terrorism. This often had the support or at least the acquiescence of local police. Many years after we moved away from a Chicago suburb, my mom said to me that when we moved there, she was told that there weren’t any black families in town because if any tried to move in, their house would catch fire and the volunteer fire department wouldn’t come. Terrorism worked, too. Decades after white riots kept black people from moving in, Cicero, Illinois is still more than 95 percent white. Rothstein’s final chapters consider what ought to be done to remedy this legacy. He does not come to any firm conclusions about specific actions, but he rightly asserts that the most important first step is for white Americans to know and acknowledge the truth about how state power has been used, and is being used, to discriminate against fellow citizens. 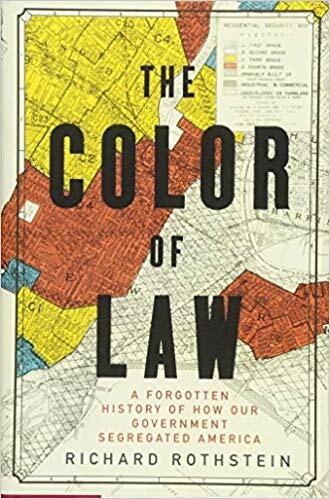 As a book, The Color of Law tends towards the dry. Hyperbole would not serve him, bare facts are enraging enough. Rothstein is not a synthesizer and storyteller as Isabel Wilkerson is in her brilliant work on the Great Migration, The Warmth of Other Suns. He is a lawyer laying out his case. It’s not an enjoyable book, it’s just a terribly important one. V glad you read and reviewed this here, tho. Sometimes, I can’t handle reading stuff this enraging, even tho I know and agree with you on its importance. Thanks for doing this. Yes, I totally do that. WTF straight people, too. And “Dude, WTF?” is a nearly endless litany. The list of nice things that we don’t have in the States anymore because white people didn’t want to share is horrible and long. Reading more about Pullman porters and rail service, I am beginning to wonder whether the death of passenger service is due to integration. I like that Rothstein talks about remedies. Just as the problems are not the result of one single action, fixing them will not be a one-time thing either.